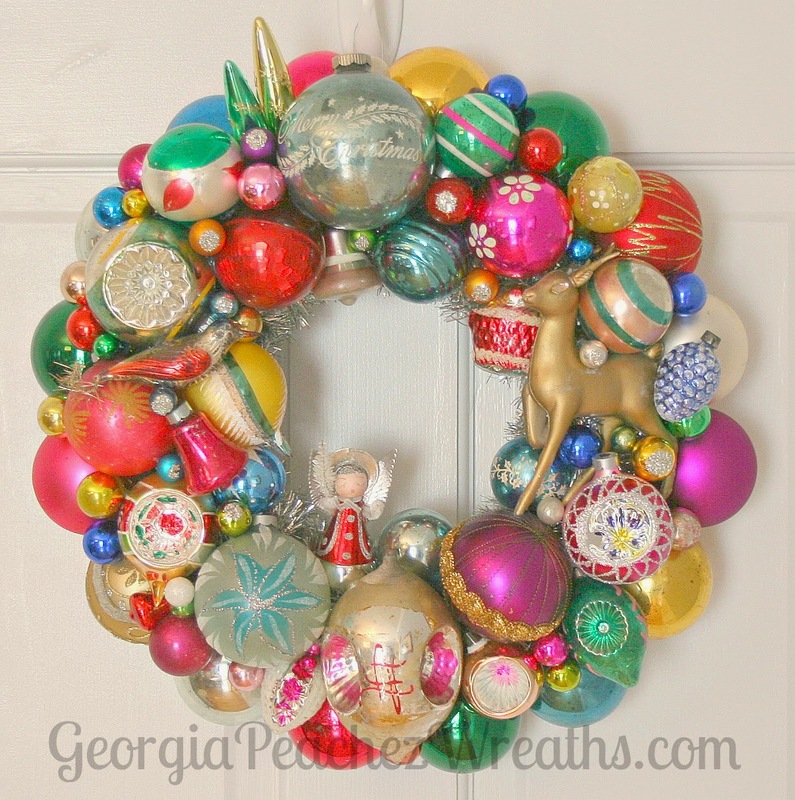 GeorgiaPeachez Wreaths has a new site. 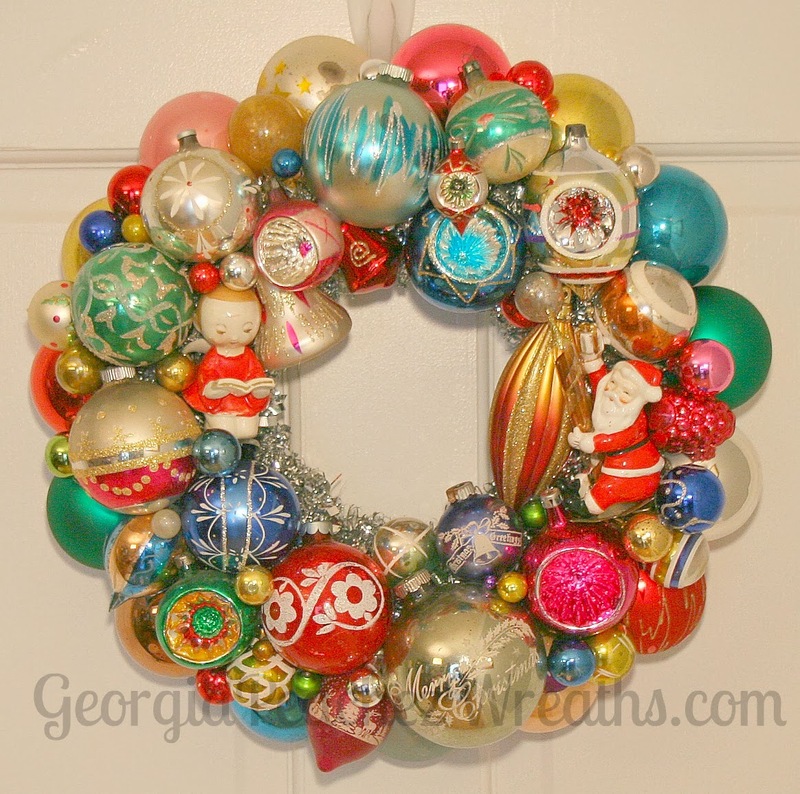 It was time to combine both of my blogs and all of my places around the web into one home. 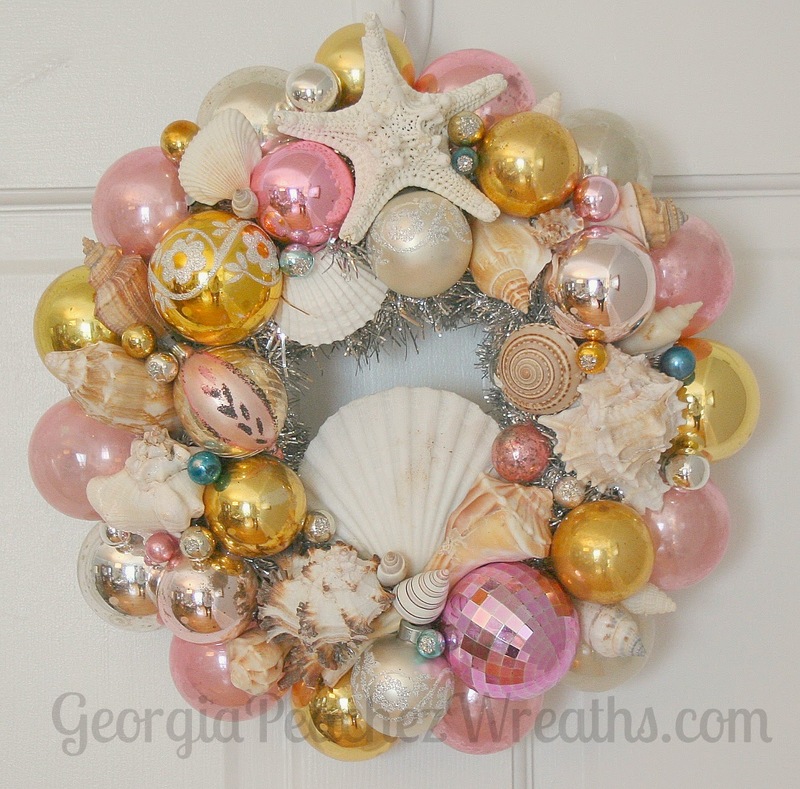 GeorgiaPeachez Wreaths is now on Twitter. 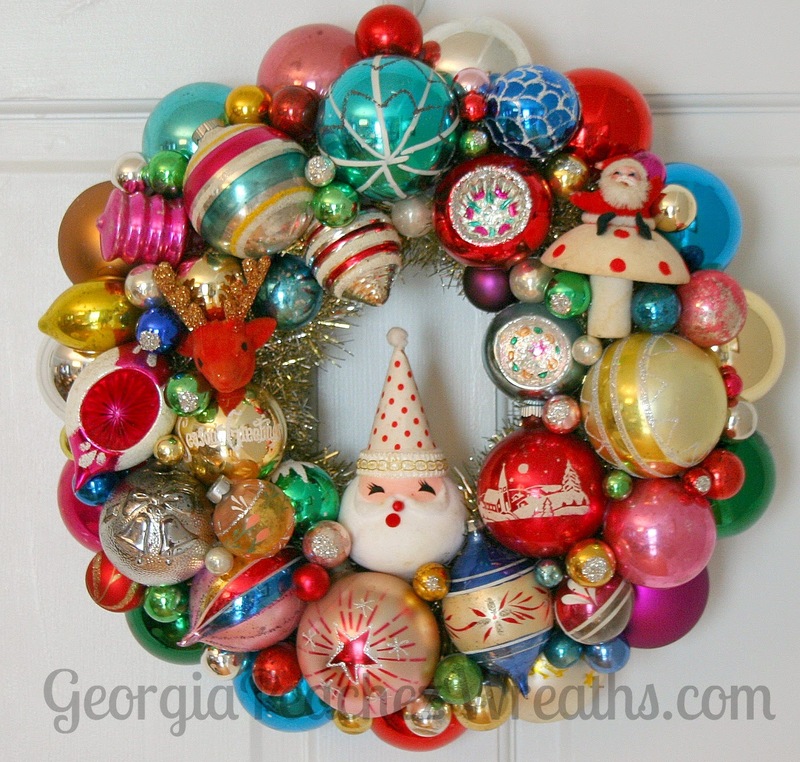 That means there are six ways to get notifications of new wreaths for sale. 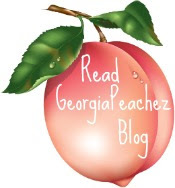 You can join my mailing list. 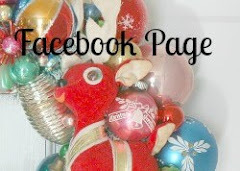 You can follow me on Facebook. If you are reading this blog, then you have already acquired the sixth way of staying informed! 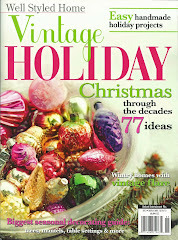 There are links on my sidebar to the shop, Facebook and Twitter. Wow, I can't believe it's August already! 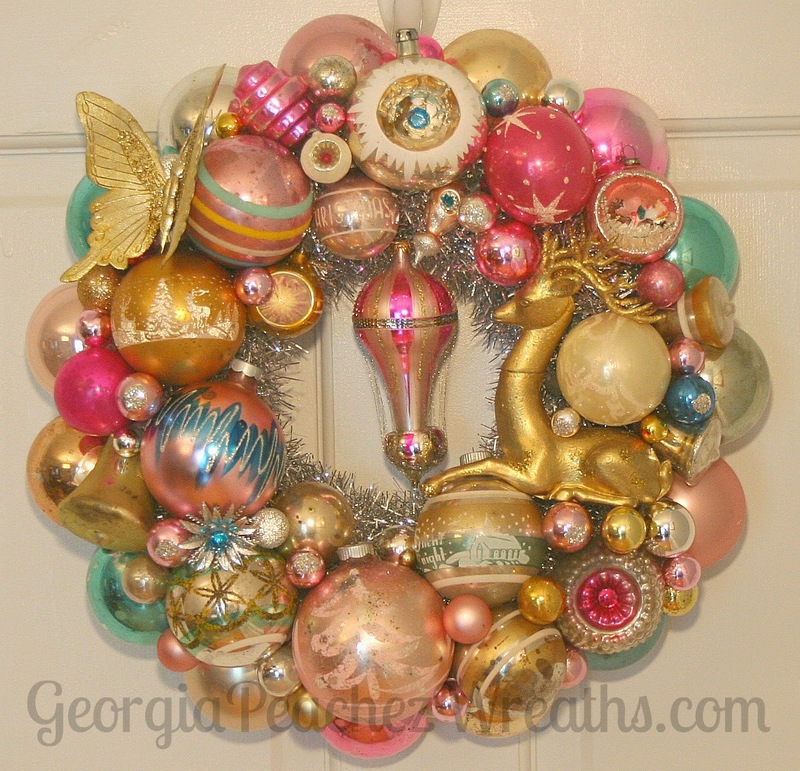 While I haven't been crafting a lot of wreaths this summer, I have been vintage ornament shopping!! 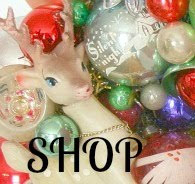 Today I have added 5 new ones to my store and my store has a new look too. These are just a preview of more to come. 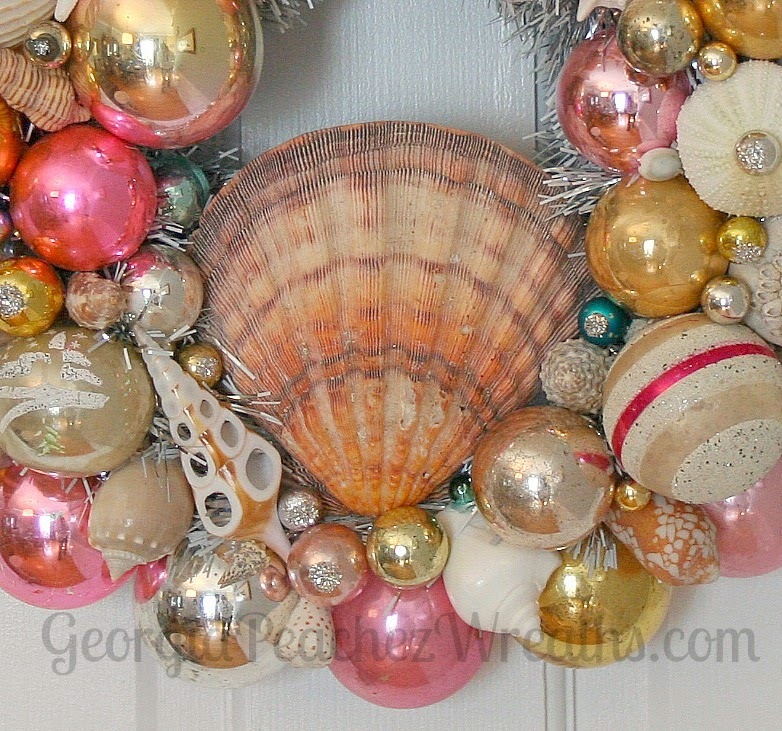 The focal shell in this wreath is so incredibly gorgeous. 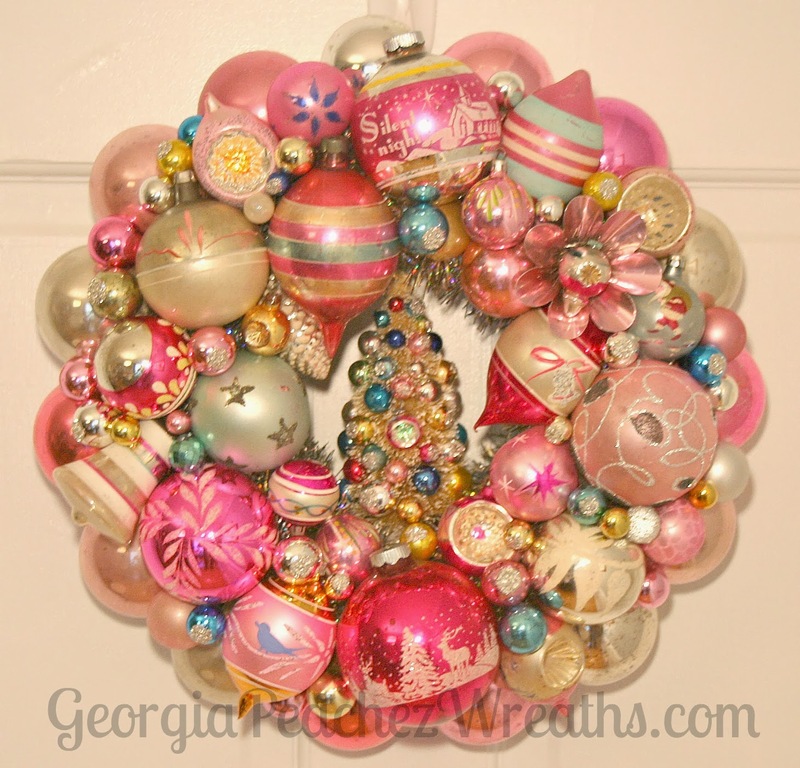 I just had to build a wreath around it, and it had to be a pink one of course. 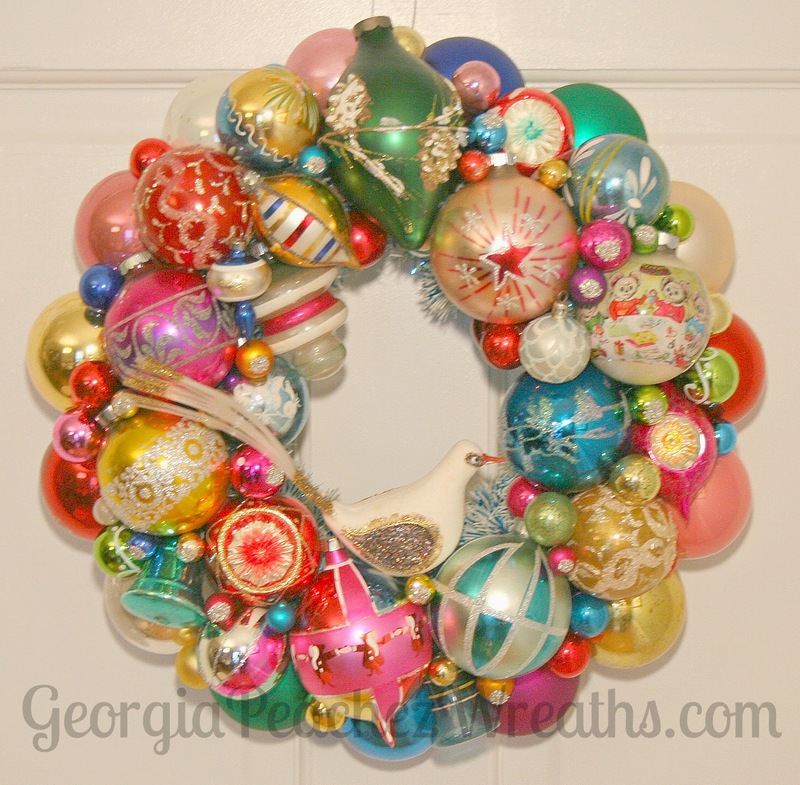 This wreath is in the shop today. 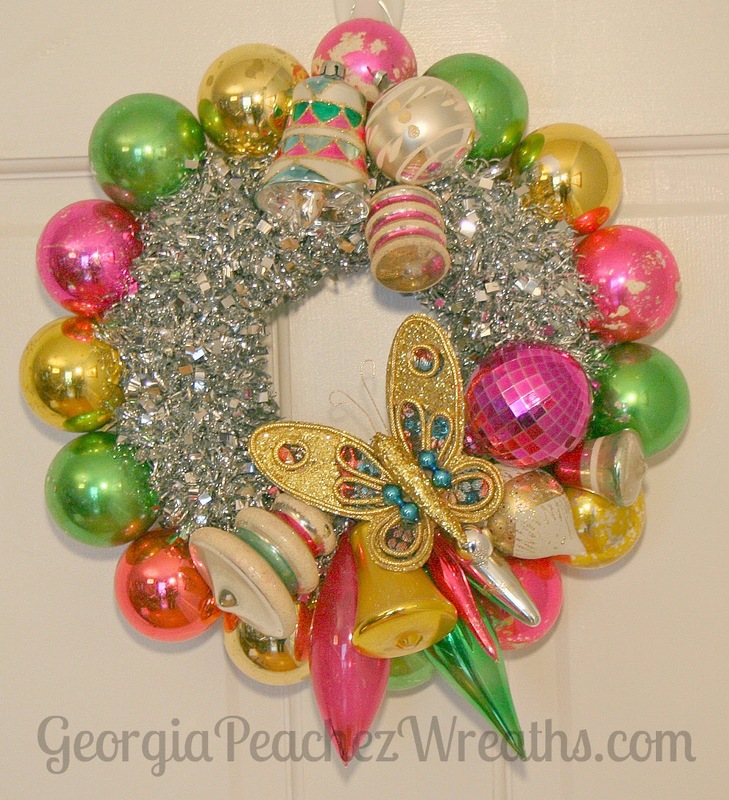 Need a pretty wreath to welcome spring? I've got lots of choices in the shop today. 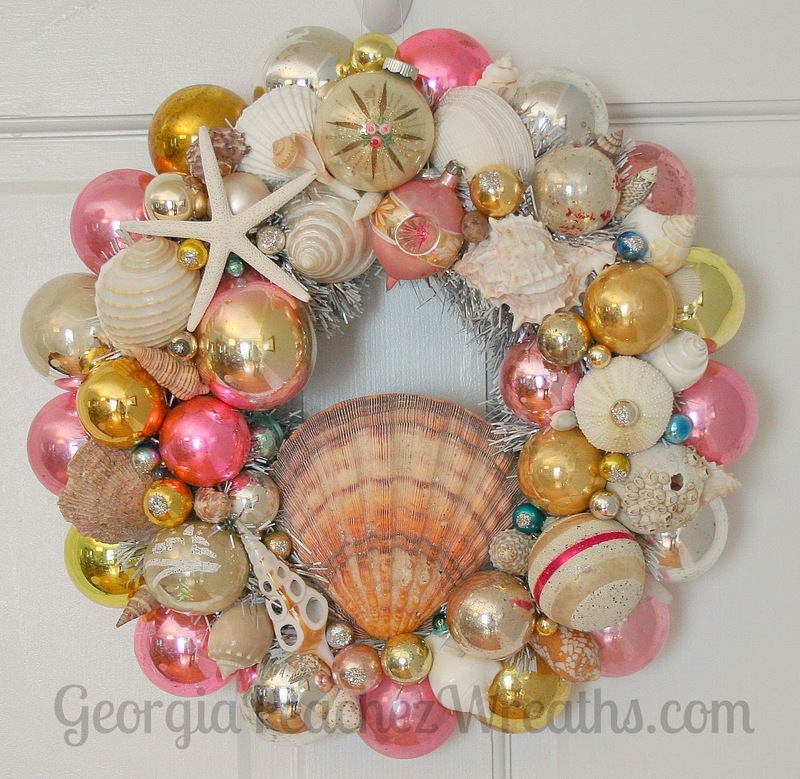 I've been having fun blasting through my extensive shell collection, combining them with my favorite thing, old Shiny Brites of course. 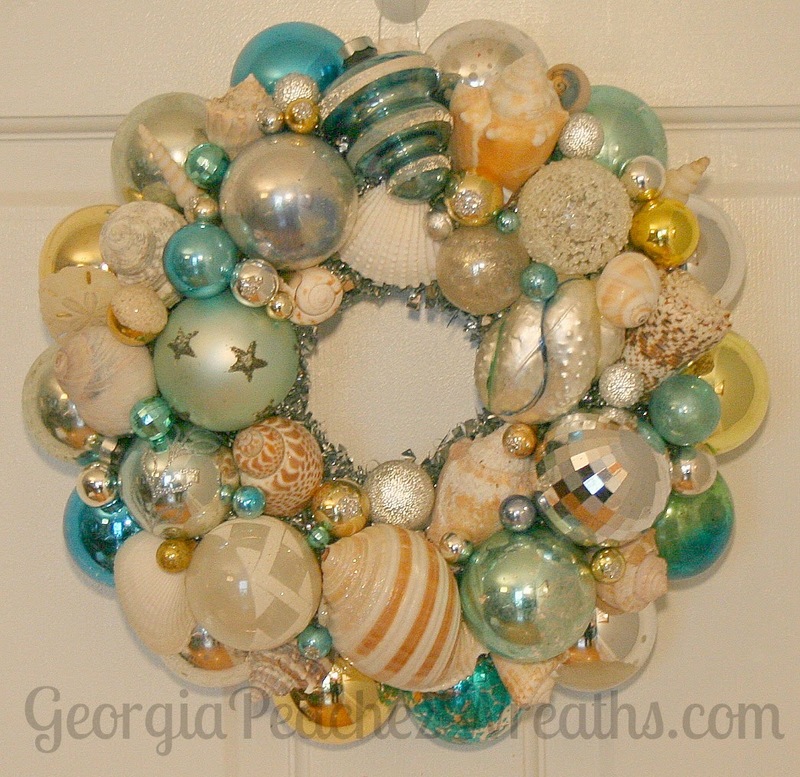 I think I will hit the beach this weekend and see if I can find some little bits of driftwood to include in future wreaths. 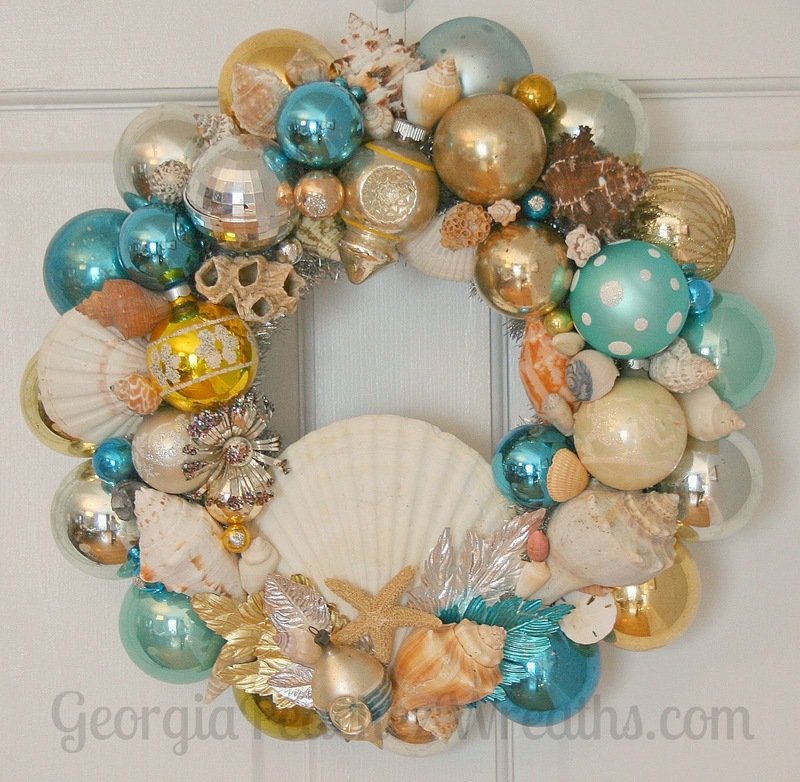 I think the turquoise/aqua, gold and silver color combination is classic beach colors. 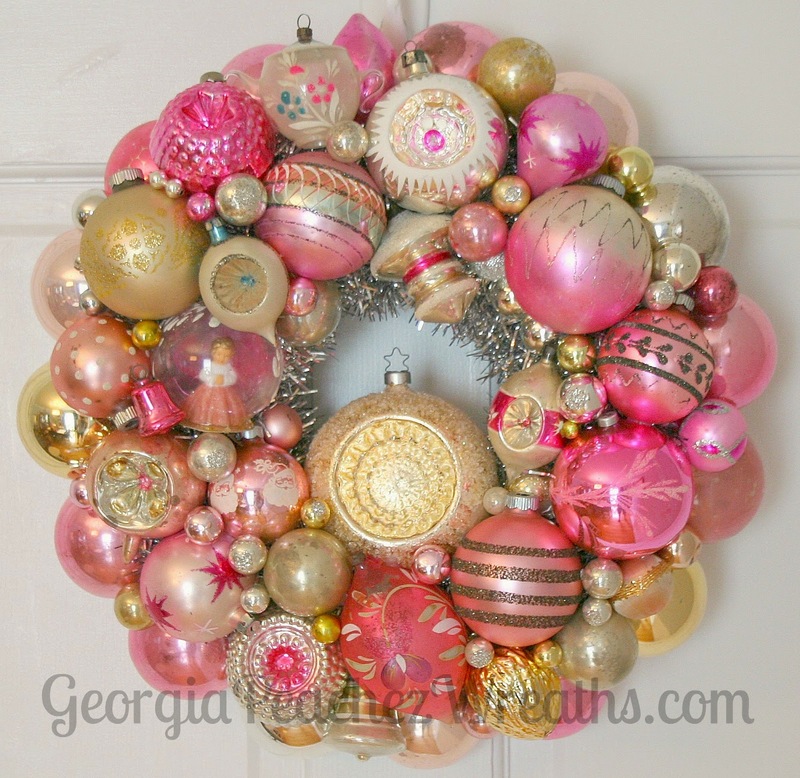 But pink looks nice too. Mother Nature is not cooperating outside. But it must be spring time somewhere, maybe Hawaii? 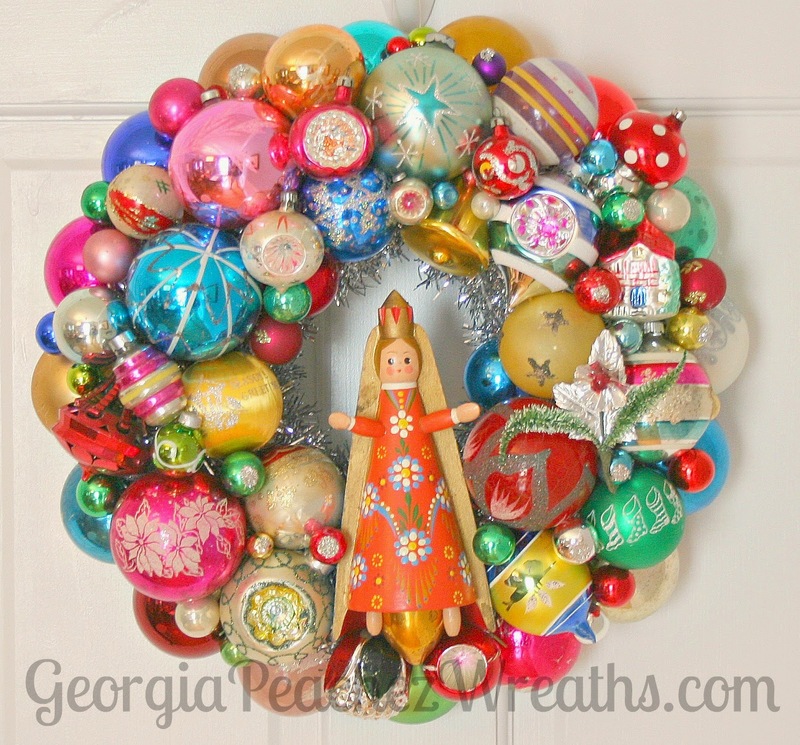 I'm hoping these wreaths will bring a bit of sunshine to the indoors. Coming soon to my store. 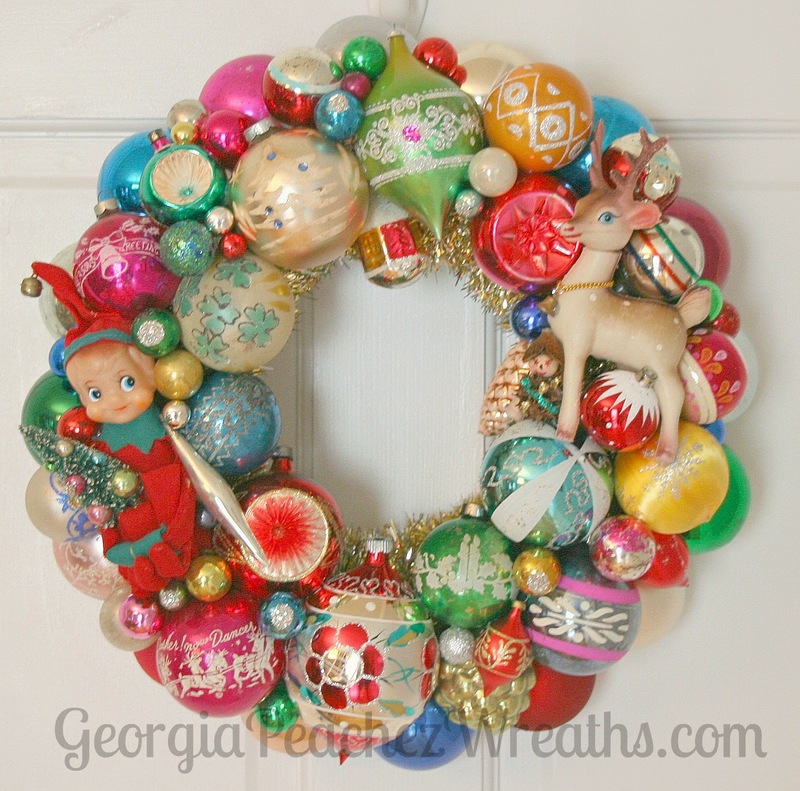 I'm starting the 2014 wreath season with a bang! 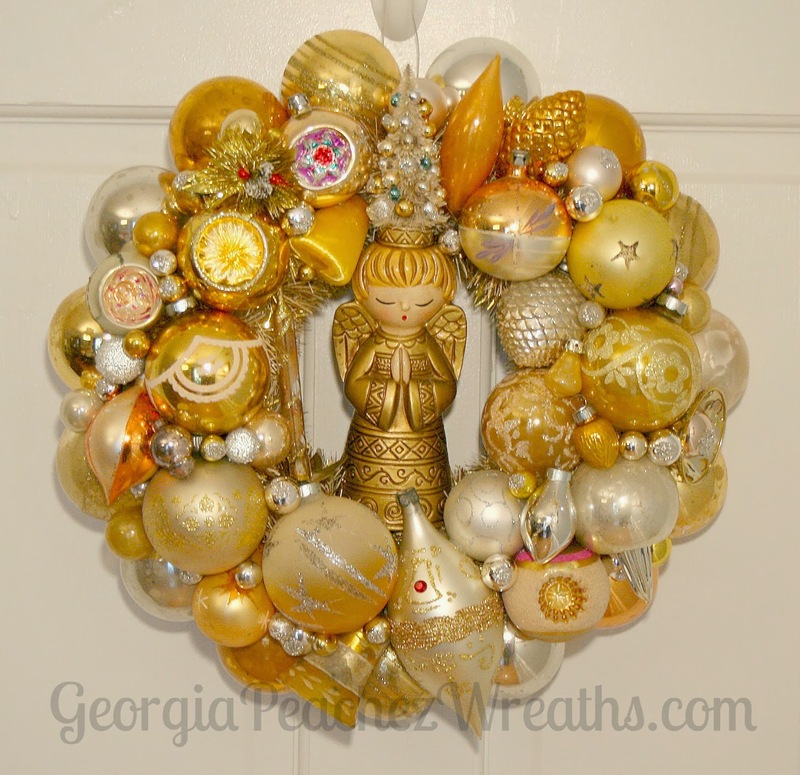 Five new wreaths and of course LOTS more to come, all year long. 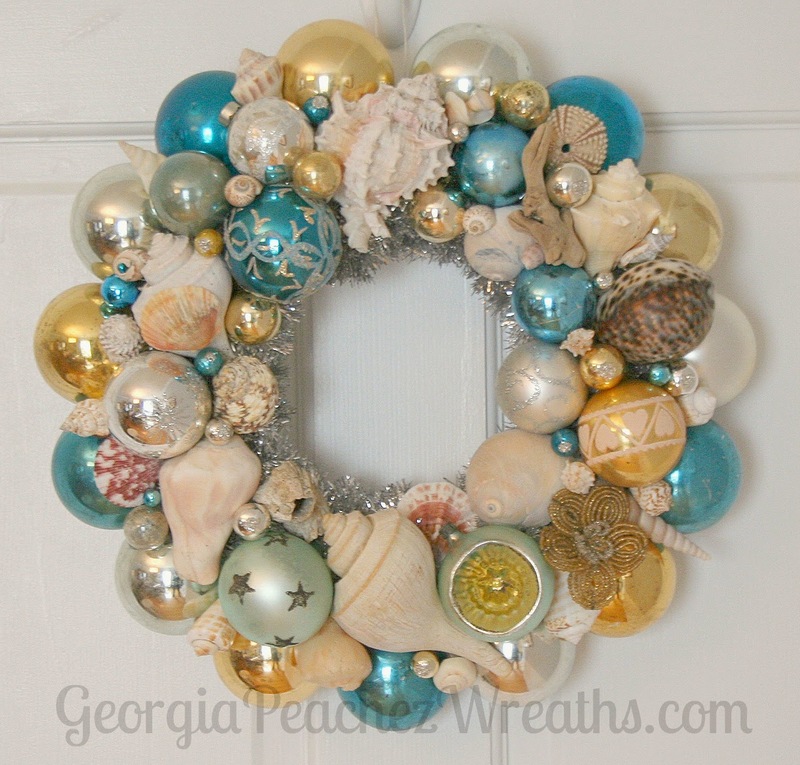 Beat the holiday rush, these wreaths are available now right here. 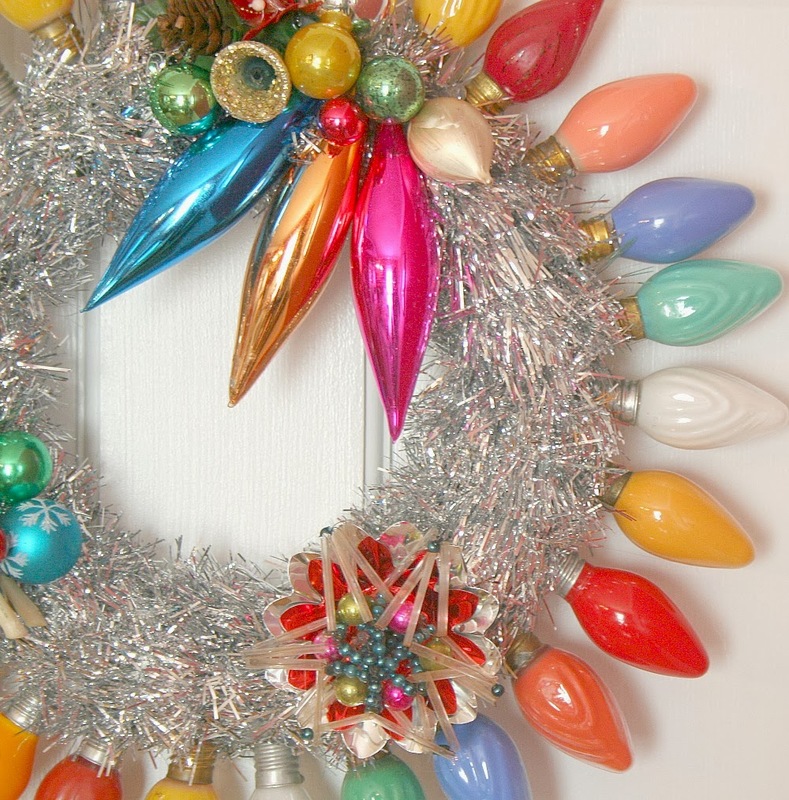 It's been close to 15 years ago when my obsessive vintage holiday hoarding led me to acquire a large stash of old C9 light bulbs. 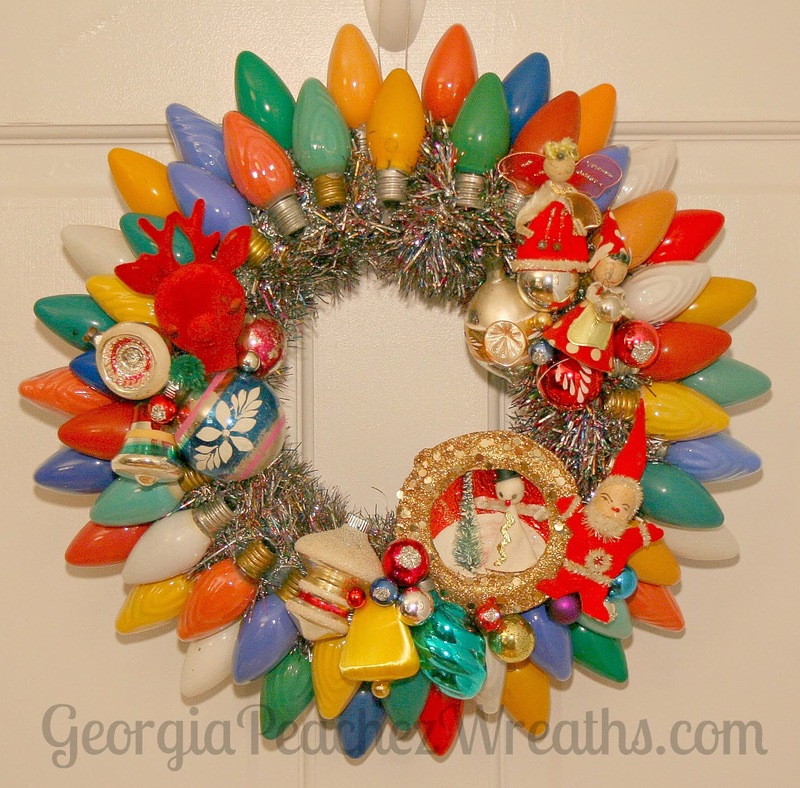 I eventually decided to try making a wreath with those lights and it turned out pretty well. 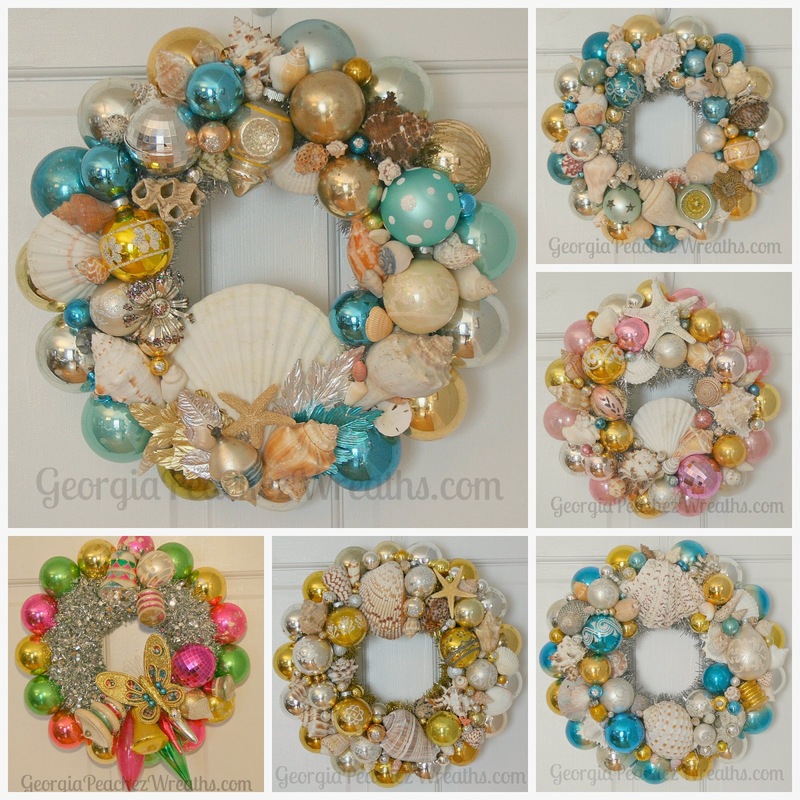 My light bulb wreaths are a GeorgiaPeachez original design and I've perfected the method over the years. 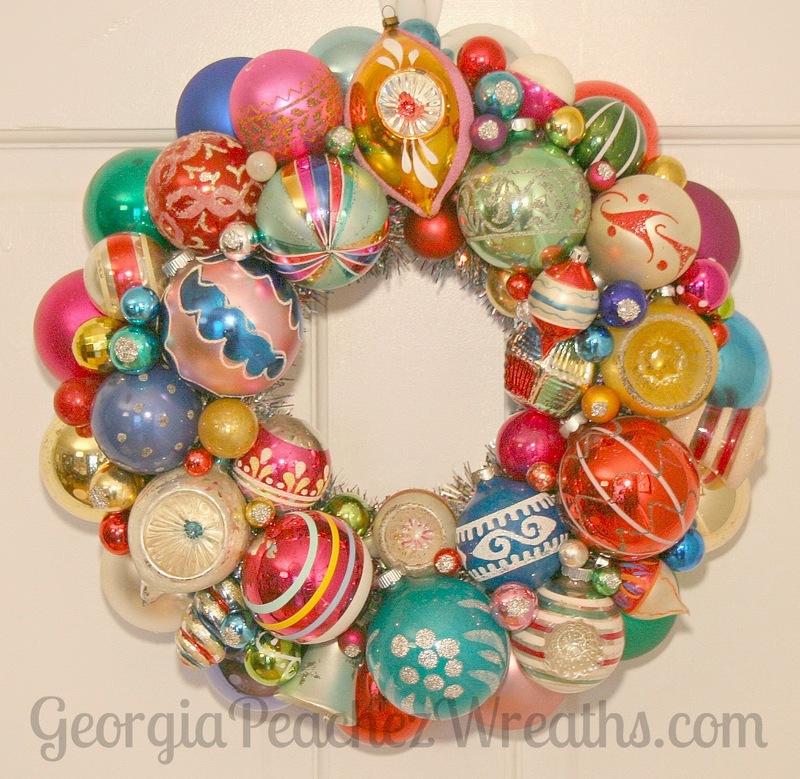 I'm working on a few of these wreaths for this year. These bulbs are pretty hard to come by now, so I will only get a few made and then that is it until I can find another load of old C9's. 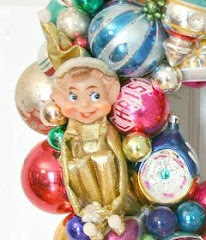 Remember when those were the standard size for your tree and for the house? That was back in the old days (my youth) and there was no such thing as white mini lights either. There is no comparison today for the great range of colors those old lights came in.